Vietnam U-23 football team advances semifinals at Asian Games. August. 29, 2018 07:41. yesbro@donga.com. When Van Toan Nguyen scored much-awaited winner, thousands of Vietnamese football fans gathered in downtown Hanoi yelled out a cheer. Vietnams’ U-23 football team made the semifinals at the Asian Games 2018 after beating Syria 1-0 in extra time quarterfinals on Monday. This is the first time for the Southeast Asian country to advance to the semifinals at Asian Games. The "Park Hang-seo’s Magic" that led the team to finish second at the 2018 Asian Football Confederation (AFC) U-23 Championships in January was proven effective in the Asian Games as well. Vietnamese football fans at the stadium held the pictures of Ho Chi Minh, the founding father of modern Vietnam, and Park Hang-seo side by side and rooted for their team. Street cheering could be seen in public places in Vietnam. Endless rows of motorcycles, befitting its nickname “the country of motorcycles,” drove around the Hoan Kiem Lake in the downtown. Rows of motorcycles that packed into the streets and the square waved the country’s flags and set off red fireworks. “Coach Park and the U-23 football team have made us proud once again,” Vietnamese online news media VNExpress reported. 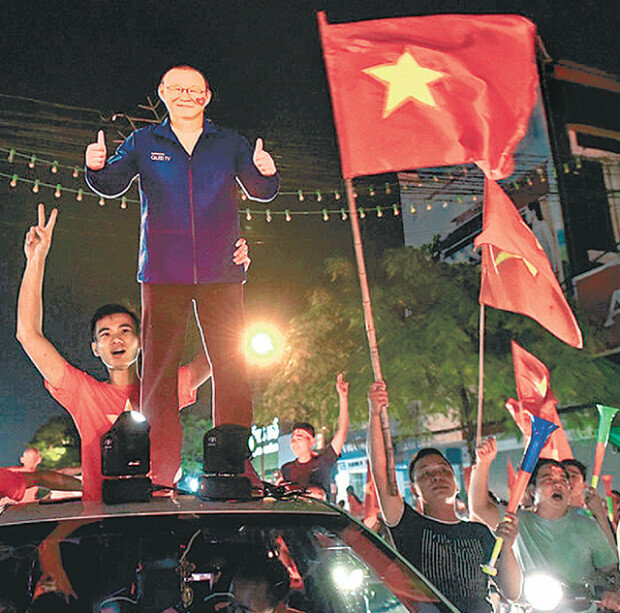 "The entire Vietnam was so excited and enjoyed the festive mood all night." The Vietnamese edition of the VNExpress posted a video of Coach Park encouraging his players ahead of the match against South Korea on the front page. “Next up is South Korea. Don’t be intimated. They’re also exhausted from the extra-time quarterfinals match. We’re Vietnam. Don’t forget that,” said Coach Park in the video.